At Emsisoft, we are known for our personal protection options. But, did you know that we also offer protection for entire company networks? Cybercriminals are motivated by money. So, high income-earning malware, like the ransomware our dual scanner catches daily, makes your successful business the perfect target. The cost of malware prevention is minimal compared to the cost of malware recovery. With Emsisoft Anti-Malware for your endpoints you know you have made a low-risk, low-impact investment in the financial security of your business. You already hold our premium licenses and run Emsisoft Anti-Malware on your network. But how do you manage all of your seats from the comfort of your chair? 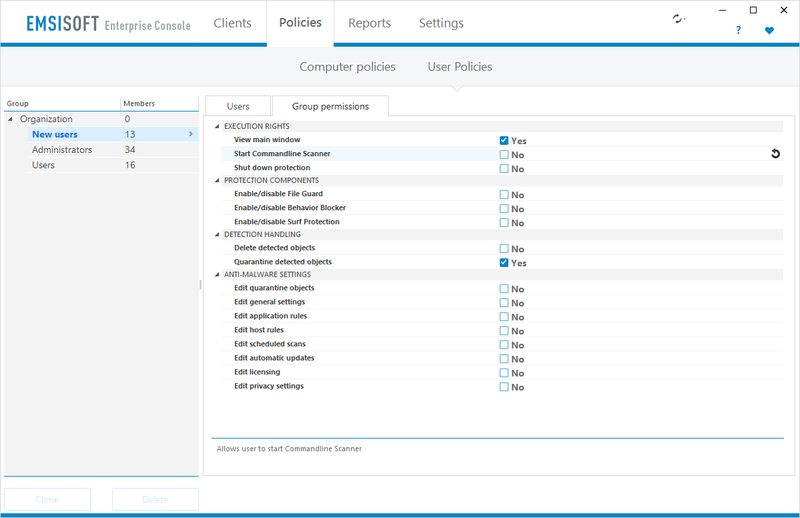 With the Emsisoft Enterprise Console tool we offer an efficient and easy way for admins to manage protection for larger companies. Best of all, Emsisoft Enterprise Console is free for businesses, where many antivirus providers charge a hefty fee for this service. With our free centralized management system, your anti-malware maintenance time is reduced drastically. 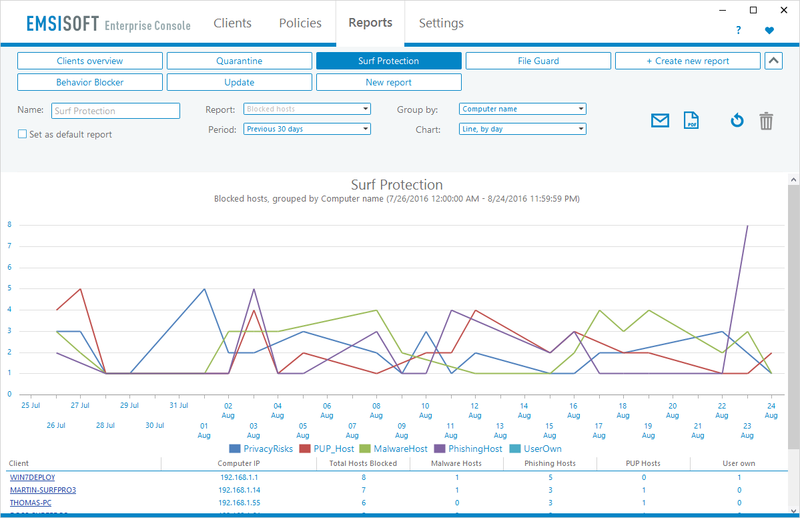 Monitor malware findings across your network from a central place. Deploy protection in batches without needing to deal with each machine individually. Manage software settings and user permissions in groups. Find and resolve any protection related issues of your clients. Save, update and download traffic with a centralized caching proxy. Receive real-time and summarized notifications via email and webhooks. So, how does Emsisoft Enterprise Console help your business specifically? Consider these common admin problems. Manually installing Emsisoft Anti-Malware on all of your computers individually is time-consuming and a waste of valuable resources. This is also true every single time you want to change the settings on all of your computers. Imagine! You’d have to get to that machine, open Emsisoft Anti-Malware and change the settings individually then move on to the next machine and the next. Emsisoft Enterprise Console allows you to manage multiple installations simultaneously from your central machine. 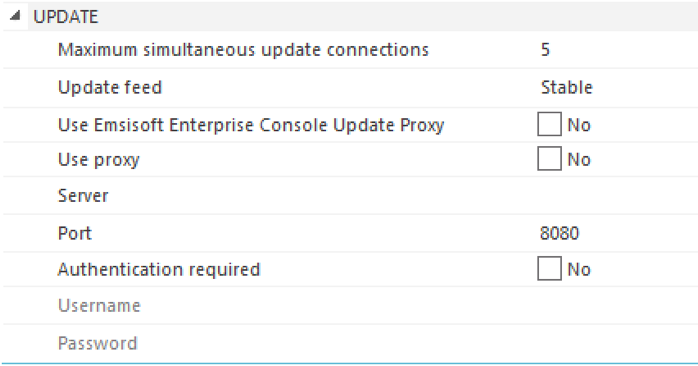 Emsisoft Enterprise Console also optionally integrates with Active Directory to use the same departments and computer management system. 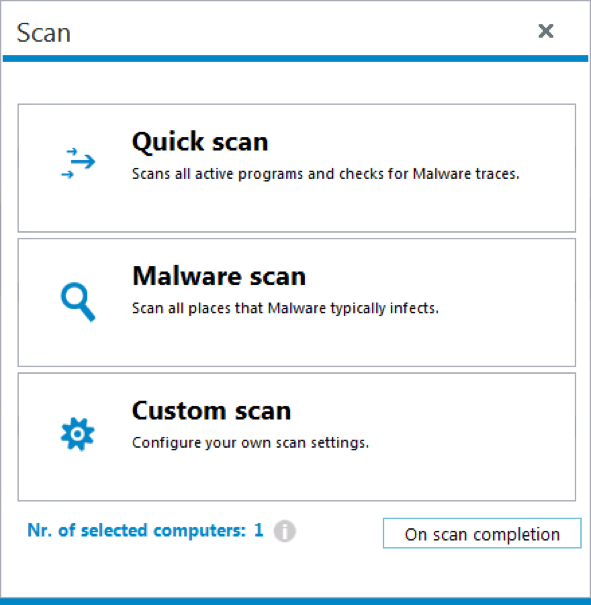 To install Emsisoft Anti-Malware on a new computer, you can either go the quick way to lookup the new machine in your network and use the remote deploy option from the Enterprise side. Or alternatively, if your client machine can’t be reached from the Enterprise server (e.g. if you’re using NAT), you can also create an installation package which can be moved and started from the Client side to connect the machine to the Enterprise server. When you have a larger network with Windows clients, all anti-malware instances must be kept up to date to protect your network from known and new strains of malware. If each machine was able to run it’s updates without any regulation, they would all download dozens of updates from Emsisoft every single day. If you have to pay for Internet traffic, this could be very costly. Wouldn’t it be great to make sure each update gets only downloaded once and distributed to all clients to save traffic? You can even ensure updates are maintained on machines that don’t have access to the internet! In your organization you most likely have teams and departments. The development team may be more tech savvy than say the marketing folks. As a network admin you must make sure that all computers are best protected and that your anti-malware is running with optimum settings. So, for the safety of your team members and for the security of your network, you may want to allow only some of your colleagues to be able to change a machine’s protection settings. Malware threats are waiting everywhere. As an admin of a larger network you want to be instantly informed when a machine is under attack. You also want to be able to identify high-risk computers and behaviours by monitoring those machines with the most infection attempts by the month’s end. With Emsisoft Enterprise Console you can enable real-time notifications by email or web-api as well as monthly advanced admin- and management-reports. An extended set of pre-defined reports allow you to quickly view recent malware findings, blocked website requests, and suspicious software behaviors. A number of available data sets can be configured to render custom reports in different chart styles, based on your organization’s requirements. See example below. Saves time: No need to remote connect or even worse, walk to each machine, to maintain protection. Saves money: Each software update is only downloaded once from the Internet, even if you have 100+ clients. Is easy to use: No matter if you have just 3 or more than 100 client PCs, it’s easy to get started. Offers a no-bloat guarantee: We are committed to maximum efficiency and protection without slowing down your system. Is free! Emsisoft Enterprise Console doesn’t cost anything, but you’ll need licenses for Emsisoft Anti-Malware on your clients. Has a technology guarantee: Always receive all new software versions via auto-update. Is customer focused: Challenge our first-class support team with any questions around the product. Enforces our standards of ethical business practice: We don’t spy on our customers or sell their data for quick cash. Let’s you see what’s going on in real time: Scan on demand to get a real-time view of what’s happening on your network. Emsisoft Enterprise Console is a centralised management tool to ensure higher efficiency in managing networks, starting from from three, up to several hundreds of clients. 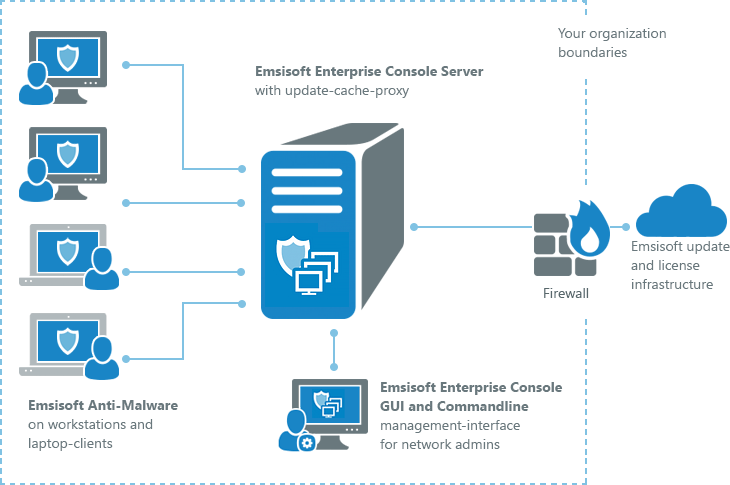 Overall Emsisoft Enterprise Console helps you to minimize the time needed to keep your network protected from malware while allowing you to always keep an a bird’s-eye-view of what’s going on. For further details, please check out the complete Emsisoft Enterprise Console User Guide. Have a great (malware-free) day!